Relatively Prime is finally ready for its big premiere, and I am happy to announce that it will happen next Monday, September 17th. We are hoping that Relatively Prime will get big buzz and we are also hoping that you will all help us achieve that buzz. So, we here at ACMEScience.com are asking all of you to tell everyone that you know that Relatively Prime is going to begin next Monday, and even more importantly forward this post(or the press release that will appear below this plea) to any science journalist, blogger, radio producer, communicator, enthusiast, or devotee that you know. Help us let the world know about the great stories from the world of mathematics. 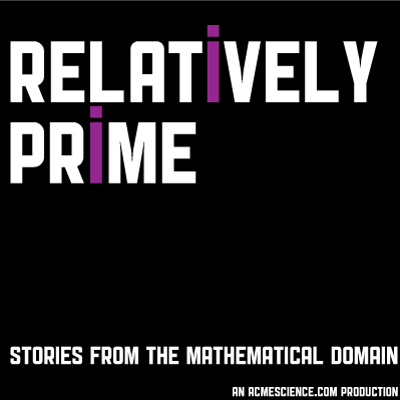 NIAGARA, WI – (September 10, 2012): ACMEScience.com is proud to announce the premiere of its brand-new podcast Relatively Prime: Stories from the Mathematical Domain. A Kickstarter funded series, the first episode of Relatively Prime will be released on September 17th and the series will run until November 5th, with a new episode being released every Monday. Produced and hosted by Samuel Hansen, Relatively Prime is an eight episode series featuring in-depth stories about the world of mathematics. While each episode revolves around a single theme, the themes themselves vary widely and include a checkers playing computer, new tools for your mathematical toolbox, and things that were flat out unexpected. The guests range widely too, from a Fields Medalist to a composer to a stand-up mathematician. Relatively Prime will be licensed under a Creative Commons Attribution-Share Alike License and Samuel Hansen is looking forward to any remixes that may result. The show will be available to download directly at the show’s website http://relprime.com, through the RSS Feed http://feeds.feedburner.com/relprime, and through iTunes. ACMEScience.com is the hub for multiple shows that range in content from video interviews of scientists discussing their newest research to panel discussions about mathematical topics liberally peppered with silly jokes and pop culture references to 80s cult Sci-Fi movies. Samuel Hansen is the producer of multiple podcasts at ACMEScience.com, including the science history show Science Sparring Society and the mathematics interview show Strongly Connected Components. He is also the co-host of the weekly mathematical news podcast Math/Maths with his frequent collaborator Peter Rowlett hosted through Pulse-Project. Samuel has a Masters degree in mathematics from the University of Nevada, Las Vegas and has given many mathematical presentations to audiences around the world.